Walking your dog is a fun and healthy way to engage as well as bond with your dog. Since taking your dog for a walk is a necessity for their health and well-being, you will absolutely need a retractable leash that stands up against daily walks. As a dog owner myself, I have to say, finding a great retractable leash can be difficult. But luckily for you, I have found the top 5 best retractable dog leashes around! Before you start to use a retractable dog leash, you need to understand the difference between these types of leashes and regular leashes. First of all, retractable leashes will be able to retract the amount of leash you want your dog to be walked on. This is typically done through a push or slide button that locks into place. With this, you can customize how close or how far you want your dog to be when you are walking. They are lightweight and the retractable leash part is typically made from a thin strand. Because of this, if you have not leash trained your dog, retractable leashes are not recommended as a first choice. However, the benefits from using a retractable leash are attractive to many pet owners. Not only can you control the length of the leash, you can easily pull the switch button to allow the leash to be retracted automatically to easily control your dog. That being said, it is necessary to prepare your dog for leash training so you can trust your dog will be well behaved on your walks. Your dog should always associate their leash with positive feelings. They should become excited and happy when they see the leash, because to them the leash means they are getting ready to go somewhere- walking, hike, the dog park, and sometimes the vet. To train your dog to be good on a leash, there are some tips you will need to follow. Of course, the younger your dog, the easier it will be to leash train them. Regardless of their age, with plenty of patience and positive rewards through treats or love, any dog can be leash trained. To get started, you will need to introduce the leash into their life- especially if they are not used to being walked. Allow them to wear their leash with their collar or harness during play and when they have their meals. This will further increase the positive association they will have with their leash as well as help them get used to it. Next, you should teach your dog a cue. It can be a snap, clap, whistle, or vocal command. Whichever you choose, make sure that cue is accompanied by a treat. Introduce the cue, and once your dog looks at you, give them a small treat. After a few times, you will notice your dog moving towards you for the treat, not just looking at you. When your dog is on its way to you, move back a few paces until he reaches you for his treat. Continue this progress until your dog hears the cue, walks towards you and even a few paces with you. As with any training, dogs have short attention spans, so you should only practice these techniques in short bursts, a few times a day so your dog does not become bored or confused. This is where you will need to use your patience. Once you dog has gotten the hang of walking with you for a treat, it’s time to start practicing. Start inside first so your dog does not get overwhelmed. Place the leash on him, give him his cue, followed by a treat. At this point you should be able to walk your dog around your house without having to force him or drag him along. If he resists, take a break and start again another time. Keep in mind, do not reward any behavior you do not want from your dog. You should also remember to only use positive reinforcement, not negative reinforcement. After a few practice rounds, it’s time to take your dog outside. Of course your dog will be overexcited and stimulated during this time, so be consistent with your cues and your patience. If your dog begins to pull or lunge away from you, make the cue and move in the opposite direction to get your dog to follow you for the treat. Making sure your dog is properly leash trained, especially for large dogs, is crucial to do before you begin using a retractable leash. 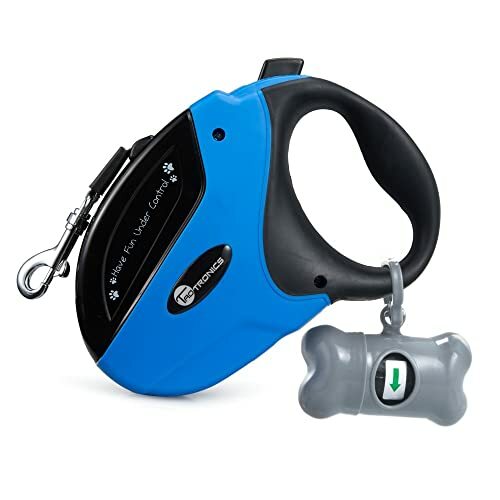 The TaoTronic Retractable dog leash measures up to 16 feet and comes with one easy to use lock in place button. With a tangle free leash, you can be sure that no matter how close or how far your dog is, when you press the button to retract the leash, it will go back into place quickly and neatly. To make things better, the TaoTroni retractable dog leash comes with a small bone shaped carrier for empty waste collection bags. This feature ensures you can easily carry bags with you on each walk. 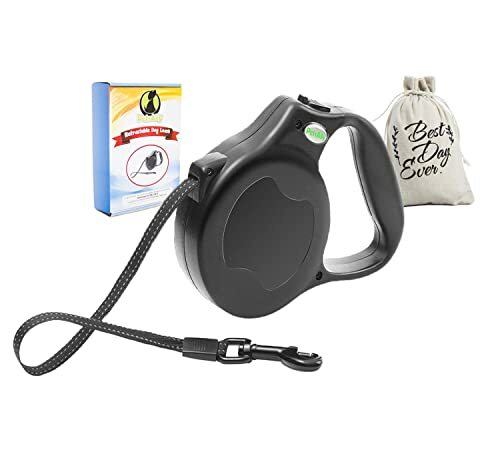 The Pet Neat Retractable Dog Leash is a strong and durable retractable dog leash that can be used on dogs up to 110 pounds. With an included break and lock button, you can easily slow or fully stop your dog when you need to. In addition, this retractable dog leash comes with a bone shaped waste bag collection carrier and four Ebooks for tips and advice on dogs. Attaching hook may be too small for your dog’s collar or harness hook, but it depends on the brand of the collar or harness you have for your dog. The Flexi North America Vario Retractable dog leash comes in multiple sizes to suit the size and weight of your dog. It is also customizable and you can purchase other accessories as well as interchangeable belts, as well as LED lights, and waste collection carriers, which allow you to make this retractable leash perfect for your dogs walking needs. With an intuitive handling system thanks to the brake button and ergonomic gripping handle, you can easily use this retractable dog leash to stay in control of your dog. 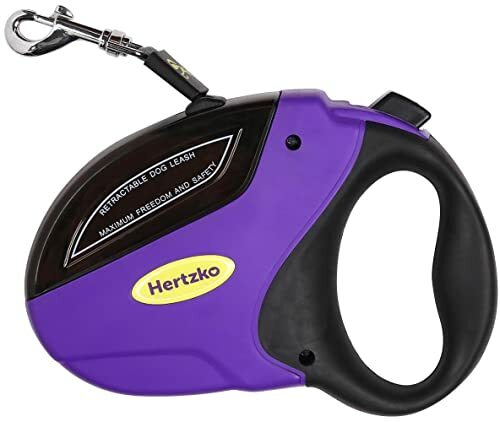 The Hertzco Heavy Duty Retractable Dog Leash definitely holds up to its name when it comes to durability and strength. The easy to use breaking system is smooth and responsive once activated. Not to mention, the non-slip grip and comfortable handle with its ergonomic design make it great to, well, handle. With up to 16 feet of usable leash, the Hertzco heavy duty retractable leash is great for dogs up to 110 pounds. And if your dog does end up lunging or pulling while walking, the lock button will stay in place to keep them under control. 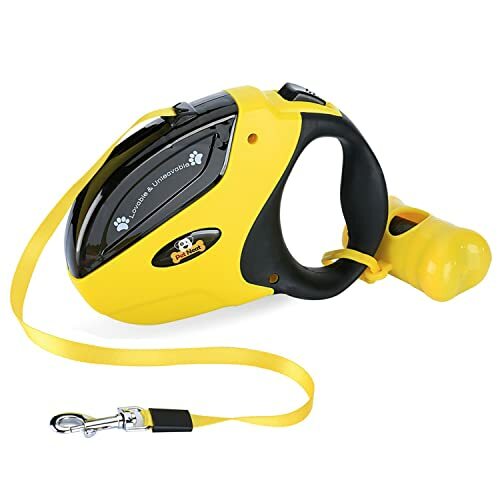 The PetsAlly Retractable Dog Leash is a fully retractable dog leash that offers high visibility reflection which is great for use at night, hiking, or camping. Retractable up to 16.5 feet with just one button to control, you can give your dog plenty of space while still staying in control during your walks. The comfortable handle allows for safe and secure holds making it easy to control. You can even use it with just one hand. The PetsAlly Retractable Dog leash supports dogs up to 110 pounds, but it is best for medium to large sized dogs. In addition with the retractable dog leash, you will receive a carrying case, and a few Ebooks with your purchase. The best retractable dog leashes will be easy to use and make sure to have powerful breaking or stopping power to enable you to maintain full control of your dog when you are walking. They should also be easy to use and comfortable to hold, with a comfortable yet strong grip. Strength of the retractable leash cable is also important- because the last thing you need is the leash breaking and your dog running free. 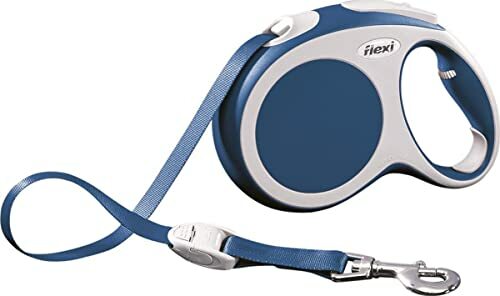 In the case of the best retractable dog leashes on this top 5 list, it would have to be the﻿﻿ ﻿﻿Pet Neat Retractable dog leash. Not only is it easy to use, it is strong and durable. The Pet Neat retractable dog leash will retract smoothly and quickly and provide you with excellent breaking and stopping power. If you are considering a retractable leash for your dog, make sure your dog is leash trained beforehand so walking is easy and fun. Making a choice for the best retractable dog leashes is much easier with the help of this top 5 best retractable dog leashes list. I hope you can find the best choice for you and your dog among these top 5 choices. Do you want to know about the best cat harness? Read more at Herekitt.com.